This week the CSA box had a big bunch of shiso. I haven’t eaten shiso—also called perilla, beefsteak plant, or sesame leaf—since I lived in South Korea over 15 years ago, so the bunch in my box inspired me to research traditional Korean dishes this week. Perilla frutescens, or shiso, is an easy to grow herb in the mint family that is usually planted in the spring and harvested in the summer and fall, unless you live in a climate like Southern California, where it can be grown year round. Shiso is rather expensive in the grocery store, so it’s great that it is so easy and prolific to grow organically. 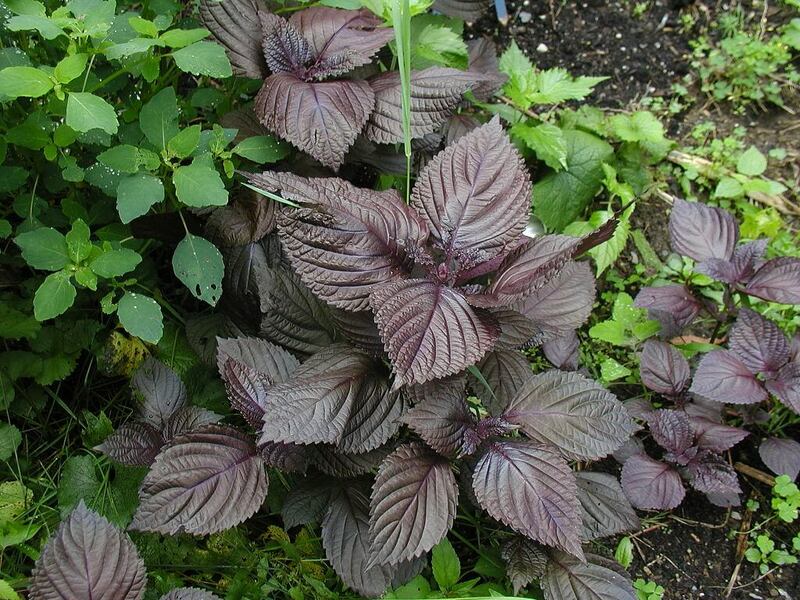 Shiso was brought to the United States in the late 1800s by Asian immigrants. It has quickly naturalized and become a common weed of pastures and roadsides in the southeastern United States. Found growing in sunny open fields, roadsides, waste places and open woodlands, shiso is a very attractive plant for the garden, and attracts butterflies and other pollinators. Shiso leaves are either red or green. The red shiso is often described as having an anise flavor, whereas the green variety is said to be spicier and more like cinnamon. (I’ve only had green.) The leaves are rich in calcium and iron, and are used in Chinese medicine to treat asthma, colds, flu and other respiratory ailments. The Japanese, in particular, use the red variety to color umeboshi and pickled ginger. Perilla seeds form an essential part of the famous seven spices of Japan, which originated more than 300 years ago in Kyoto. Green perilla leaves are often wrapped around sushi or served with “sashimi” as a garnish. They also are added to soups, tempura or dried and sprinkled over rice. Japanese chefs add red perilla to tofu or bean curd dishes or use it wrapped around pieces of meat. Shiso has a unique flavor: pungent and grassy, it contains strong flavors of spearmint, basil, anise and cinnamon. Slicing it into long skinny strips really brings out these flavors. Most sushi fans are probably familiar with the leaf, but chopped shiso buds are especially delicious. Shiso seeds are packed with aromatic flavor, and they’re especially good toasted and crushed on top of fish. julienned and sprinkled on a simple citrus or mixed green salad. minced into or as a leaf wrap for tuna salad—shiso LOVES tuna. chopped up with fresh fruit (plums, especially). chopped up and added to roasted or stir-fried veggies. as a leaf wrap for barbecued meat or tofu. in scrambled eggs, especially with a generous spoonful of unsweetened yogurt. Here’s a delicious, traditionally Korean way to use shiso and nourish your digestive system at the same time. And who couldn’t use another delicious fermentation recipe? Here's a delicious, traditionally Korean way to use shiso leaves and nourish your digestive system with fermented foods at the same time. Adapted from Wandering Chopsticks. Wash shiso leaves and remove stems. Stack the leaves putting a fine layer of sea salt in between every other leaf. Put the leaves into a glass or ceramic bowl with just enough pure water to cover. Leave for several hours or overnight. In a separate bowl, mix the rest of the ingredients together until you get a loose paste. Using a butter knife or the back of a spoon, spread a little bit of the paste in between every other leaf, until all the chili paste is used up. Fold up the whole stack and place into a clean, sterile Mason jar or fermenting crock. Add pure water until the leaves are covered, then close the jar loosely, or use an airlock fermentation lid. Leave in a cool, dark place to ferment. This takes about a week, though in cool weather it could take longer. Unless you are using an air-lock fermenting lid, you should check the lid every day to see if any fermentation gas needs to escape. Serve a small plate of the leaves to be eaten as a banchan (side dish), mince the leaves into vegetables or salads for a spicy kick, or eat your fermented shiso by wrapping a leaf up with some lettuce and bulgogi (Korean BBQ). You have failed to mention the important fact. Purple shiso is used not only for the color, but it has a powerful preservative component for pickling. You can pick the leaves, sprinkle salt on each leaf and save them in a container for later ( when it is not available) use for pickling, . Store in a refrigerator…last for 6 months. Some health stores carry the packages. Hi! I’m Korean and hope it’s okay to add a few more details. We also use the leaves in barbeque. We get a leaf or romaine lettuce, layer a shiso leaf on top, then lay on a bit of barbeque meat and other little things, roll it up and eat! 🙂 Another thing I wanted to mention is that Shiso is related to mint, I just discovered that when trying to explain what Shiso is to a co-worker. I realized it does taste similar to mint too. Not exact but close. Thanks for that! I enjoyed shiso-wrapped bulgogi often while I lived in South Korea. It is quite delicious! I live on Eastern Ll NY in a farming area. I have a red shiso growing wild in my garden. It spreads each year like a weed. I just discovered what it is. I juice, so I’m going to add it to my mix of kale, bok choy,celery,and parsley, plus some fruits for sweetness. I’ll let you know how it turns out. This is a fascinating post and until this day had not heard of Shiso- I am not sure whether we can get it over here in the UK but will look for it anyway as I just have to try this! Thank you so much for sharing this with us on Natural Mothers Network! What an informative article! Thank you so much for sharing your great post on Allergy-Free Wednesdays! Be sure to check back next week for recipe highlights (including the top 3 reader choice submissions and hostess favorites). I would like to know if shiso plant will die after flowering. I live in hawaii where the weather is suitable for shiso. Must I replant every year? Can I pluck off the flowers so it doesn’t seed so the plant will still survive? I have the green shiso plant. Shiso is a perennial in the mint family, so it may die back after flowering (depending on your climate), but given the right conditions, it will return year after year. I live in Jax, Florida. I planted one Red Shiso plant a year ago and have had so many seedlings (perhaps 1,000) that I have no clue what to do with them. I don’t fertilize or spray the plants but they grow fasting than any weed. To answer your question- if you let it go to seed you will have hundreds of plants. The only problem is how to use them.